Traveling internationally with your dog may seem like a big undertaking for many owners from the United States (US). The resources below are available to help streamline your approach for getting to your end destination, planning your stay, what to expect, and helpful tips. There are various dog friendly hotels in France, Japan, and Singapore. You can use almost any hotel search engine to filter by “pet friendly” and “location” (start with properties closest to the clinic). Another option is finding an Airbnb (a short-term property rental) that accommodates your needs. Having a place to cook your own food and access to a washing machine are a few potential advantages of having an Airbnb rather than a hotel. >> Will they allow pets? Even if an Airbnb is marked “no pets”, inquire with the owner. Some will make an exception if you explain your circumstances. >> Is the rental/hotel within walking distance to the clinic? >> Is the flat easily accessible? Are there stairs or elevators needed to get there? Remember post-surgery, it will be difficult to get your dog to and from the flat and you will likely be using a stroller. >> Is there a washing machine? Is there a dryer? Many flats have washers only. In that case, clothes can be hung dry. >> Is the kitchen equipped with the things that are important to you? If you plan to make homemade meals, a refrigerator, freezer, cooktop, microwave, etc. are key amenities to include in your search. >> Is there air conditioning? Most apartments don't have air conditioning so make sure you know what you are reserving, especially during the summer months. 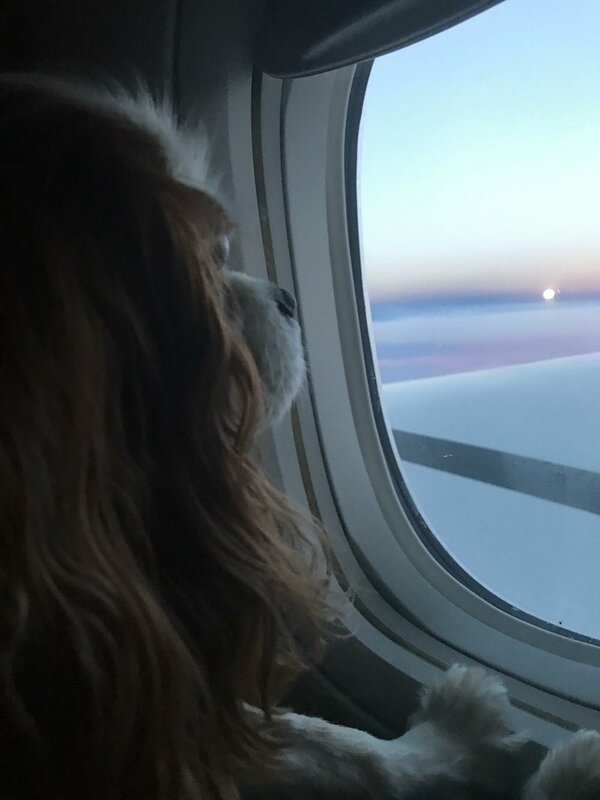 As part of the Air Carrier Access Act (ACAA), The Department of Transportation (DOT) has set specific guidelines for flying on commercial airlines with an Emotional Support Animal (ESA). All airlines will require an ESA letter, and some may also require a signed veterinary health form and/or immunization record (current within one year of the date of travel) and a signed confirmation of animal training form at least 48 hours in advance of departure. Please check with your airline to make sure all paperwork is submitted and accepted prior to showing up at the airport. Must be from a verifiable mental health professional (e.g., psychiatrist, psychologist, licensed clinical social worker, or medical doctor) that is treating the passenger's mental or emotional disability. Must be no older than one year from the date of your scheduled flight. Must be on the letterhead of a licensed mental health professional. The date and type of the mental health professional's license, the state or other jurisdiction in which it was issued, and the license number. Typically, 48 hours of advance notice is required by airlines to process an ESA request. Please review the guidelines of the airline you plan on flying in advance to ensure that you have made proper arrangements prior to the departure of your flight. Failure to follow all guidelines instituted by the airline could revoke your right to fly with an ESA, and you may be charged normal pet travel fees or be excluded from flying with your ESA. You can find a sample ESA letter for airlines here. >> DOT does not mandate that ESAs be registered through a national registry program. All that is required to fly is an ESA letter from your licensed mental health professional and prior approval from the airline. >> It’s highly recommended that you identify your dog with an ESA ID or vest to avoid any confusion or conflicts at the airport. >> If you do not have a licensed therapist to write your ESA letter, you may use a third-party such as Certapet who will write a letter for you for a small fee. >> Unlike other service animals, ESAs are not required to be trained or perform a service for their owner. The only requirement is that they don’t cause any disturbances during the flight. Many owners who have traveled to France for surgery have had good experiences with Delta/Air France, United, and American Airlines. Airlines may require advanced notice to accommodate ESAs traveling in the cabin. Generally, if an ESA letter is presented and accepted by the airline, your dog will be allowed to sit with you in the cabin, on your lap, or in between seats if you are traveling with a companion. Click on Special Concerns then Service & Emotional Support Animals. To arrange travel with an ESA, call the general reservations number listed above. Delta airlines requires an ESA letter, a signed veterinary health form, immunization records (current within one year of the date of travel), and a signed confirmation of animal training form to be submitted 48 hours in advance of departure. United charges an additional fee to make reservations on the phone. We recommend that you speak to a service agent about traveling with an ESA, and then either book your ticket(s) over the phone or online with their guidance. Customers traveling with an emotional support or psychiatric assist animal must provide a minimum 48-hour advance notification to the United Accessibility Desk by calling 1-800-228-2744 and submitting the required documentation by fax (1-872-825-0208) or email. American charges an additional fee to make reservations on the phone. We recommend that you speak to a service agent about traveling with an ESA, and then either book your ticket(s) over the phone or online with their guidance. >> Always speak with a reservation agent before you book your travel as they will be able to advise you on the latest ESA requirements and restrictions specific to that carrier. >> Airlines restrict the number of animals permitted on each flight so plan in advance, and make your airline reservation as soon as your surgery is confirmed. >> Consider breaking-up your flight if you are traveling from west coast to Europe or from east coast to Asia. This will allow your dog time to relieve itself while en route to your final destination. >> Bulk head and aisle seating is recommended to ensure that your dog has enough seating space and easy access to walk around the cabin (note: dogs are not allowed in exit rows). >> In preparation for the flight, restrict meals and water where appropriate. As needed on the flight, give water and food to keep your dog hydrated and fed during the flight. >> With an ESA, you qualify for pre-boarding. When you reach the gate, speak with the gate agent to arrange pre-boarding. >> If you have a dog stroller, it can be checked on the jet-bridge as one would do with a child's stroller. The gate agent should provide a tag for you to identify your property, and it will be stowed during flight and returned to you at each destination when you exit the plane. >> Check out PetFriendly Travel for the latest listing of animal relief areas at US airports, and take your dog as close to boarding time as possible. >> On your flight home, obtain a letter from Dr. Sabine Bozon so your dog can be walked during the flight to avoid blood clots (protocol is to walk your dog down the aisles for five minutes every two hours). Navigating a busy airport with your dog and extra traveling gear can be challenging, especially if you have an anxious traveler. Taking every possible option to expedite your way through security checkpoints and customs/immigration is a life saver. In the US, if you have a US passport, you have the option to register as a Global Entry participant. At most major US airports, this will get you into the TSA pre-check lines and into the Global Entry access lines upon re-entering the US. There is a $100 registration fee, which is good for 5 years of unlimited international travel, and you will do an in-person interview to be confirmed. To read more and sign up, click here. Each country you travel to with your dog will have different import requirements. Even the US has different requirements for pet re-entry depending on where you take them. You can find specific details on import/export to/from France, Japan, and Singapore on our corresponding travel resource pages along with the proper United States Department of Agriculture (USDA) forms and procedures to use. Traveling internationally for approximately two weeks with your dog can seem like a daunting task. This packing list is our attempt at helping you think of the things to bring that you may have forgotten, and a little guidance on what you can check through vs. what you need to bring with you on board the plane. >> Most collapsable strollers do not stay in a tidy compact position for stowing at the gate. It is helpful to have a velcro strap, small bungee cords, or twist ties with you to help secure the stroller so that it does not get damaged. >> If you choose to bring a pet carrier in the event your flight crew wants your dog to be stowed for takeoff/landing, verify the maximum dimensions with your airline. >> A pet carrier is required for travel to and from Japan airports. >> Secure money before leaving the US because not all ATMs are open 24x7 at the airport. You may need money to pay for transportation or money may be need if you encounter an emergency. >> You will need to pack for a full two weeks, but consider packing a small quantity of the follwing items as carry-on to get you through your flight: food, treats, poop bags, diapers, pee pads, and medications. >> Diapers are helpful on the plane if your dog is not trained to use a pee pad. You can use baby diapers and cut a hole out for the tail as a cheaper solution to specialty dog diapers. For additional information, visit our FAQ page.